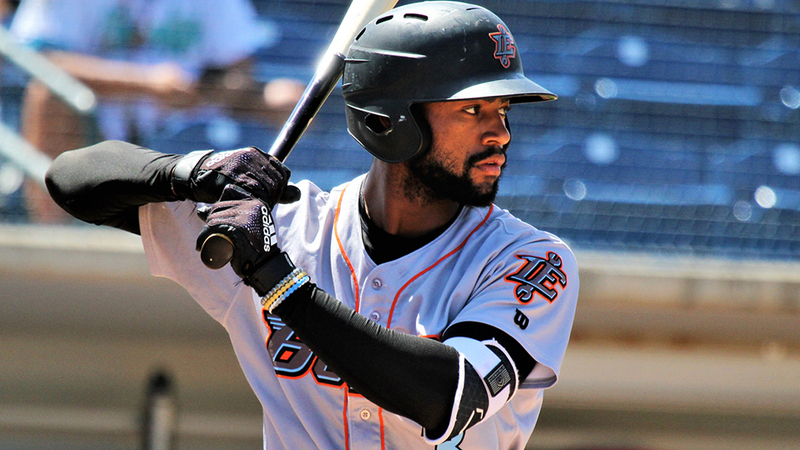 It took Jo Adell more than two weeks to get his first three-hit game in the California League. Now he's binging on them. MLB.com's No. 53 overall prospect notched his third three-hit game in the last six days, homering and adding a pair of singles, as Class A Advanced Inland Empire fell to visiting Lancaster, 4-3, on Wednesday at San Manuel Stadium. Adell kicked off another big night at the plate with a solo homer to left-center in the bottom of the first inning. The blast, his sixth with the 66ers, was his second in three games and third during his torrid week. Two innings later, the Angels' No. 2 prospect followed a two-out triple to right by fourth-ranked Brandon Marsh with an RBI single to left and scored one batter later on Jack Kruger's double to center. Adell led off the sixth with another base hit but was retired on a comebacker in the eighth. The 19-year-old has 13 hits in his last 22 at-bats and is 17-for-40 (.425) during a nine-game hitting streak that's boosted his average to .275. It was .157 entering play on June 5 after Adell's first 12 games in the Cal League. The Louisville native put up a .326/.398/.611 slash line in 25 games with Class A Burlington and was promoted to Inland Empire on May 22. Rockies No. 2 prospect Colton Welker delivered an RBI single in a four-run fourth that carried Lancaster to the win. Cal League home run leader Roberto Ramos chipped in three hits, including a double. JetHawks starter Ty Culbreth (2-3) gave up three runs on seven hits with seven strikeouts over seven innings for the win. Reid Humphreys fanned one in a perfect ninth and grabbed a share of the league lead with his 13th save.